Hey everybody! So, as the lovely month of October progresses, and I keep working on my (oh so many) comic projects and artwork, I figured it was high time to advertise a couple of conventions I'll be vending at VERY SOON! A long standing convention which I've seen grow from the very first show they had up at the hotel in Troy, I'll be participating in their artist alley! I will be listed under the name Crash Bang Labs, and I'll have a (hopefully new, darker colored) teal tablecloth, and a WHOLE NEW SET UP! We unfortunately don't have any table placements yet, but never fear, we're gonna be in a pretty big openish area that you can't miss! If I hear anything before the show I'll let you know! SIDE NOTE: Cosplayers! Some of the rules have changed in regards to the GM-Specified areas in the Renaissance Center. Youmacon is currently negotiating with GM to find out the details for you, but if you are curious what it's all about, you can go to their FAQ. As always, please be courteous, remember, we're technically invading their space, so let's be kind to the locals! A brand new show I've never been to. I'm waiting to hear if we'll get our spot locations listed ahead of time, and I'll let you know the minute I find out! From the research I've found, it looks to be about a Shuto Con sized show (5000+ people?) their schedule has officially been posted, and there's a LOT of things for people to do, so I'm very excited for it! I will of course be bringing all the new items listed above - Sketch Cards & Prints, Sketchbook, new Prints! If you happen to be in the area, stop by and say hi! OH! 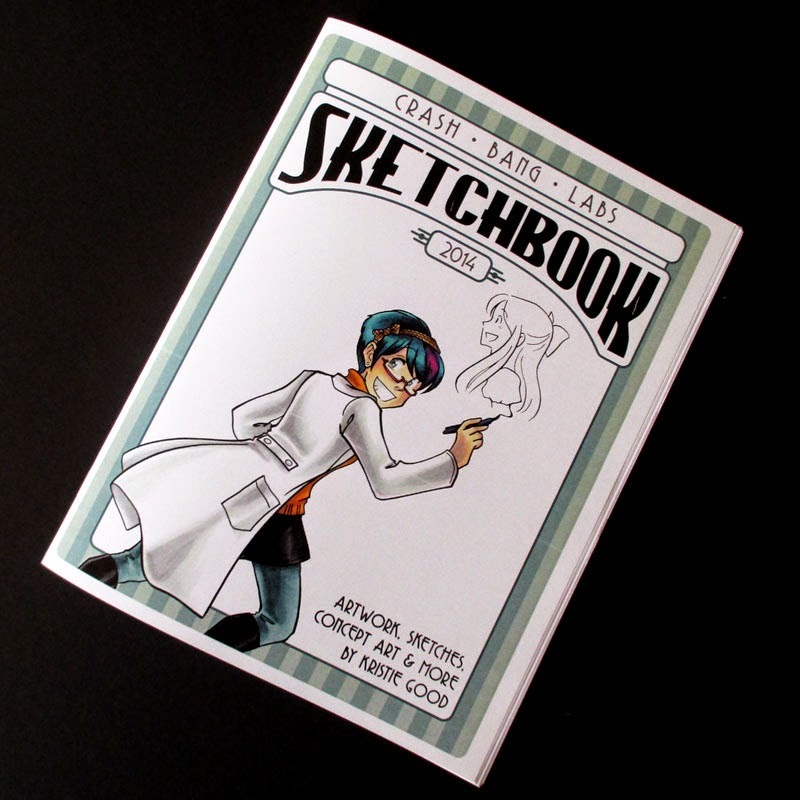 I'll also be doing commissions on site as well, so if you're interested I can do a sketchcard or brown paper image for you! I didn't want to make a whole other post for this, but I have some future convention news that came my way! Firstly, I can't remember if I said it or not, but I was accepted into OHAYOCON'S Artist Alley, and I'm all paid up, so I'm OFFICIALLY IN. 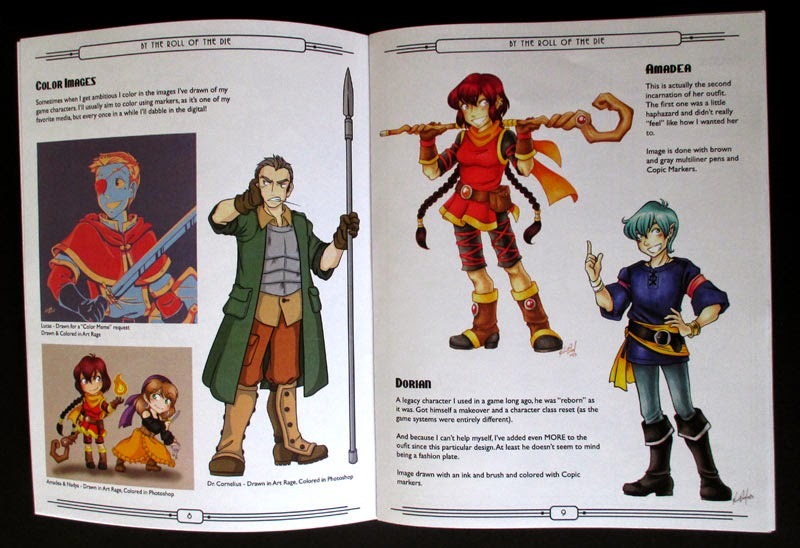 I'll be really working on cranking out books the minute I get back from Nekocon, I'm hoping to have an art book, a 2015 sketchbook, and new comics for everybody at the show (since it's Original Artwork Only, I really want to have a lot of nice products for people!). I'll also be offering at-con commissions too! And, even more surprisingly, just the other day, I received a confirmation on my acceptance into KATSUCON'S artist alley! Honestly, I'm really flattered I got in. I didn't make the cut last year, but that worked out because it was the convention a snowstorm ate, but this year... this year they had apparently 400+ entries for 200 tables, and most likely with the same 50/50 split given to 3D Artisans & 2D Artists. I was very surprised, and pleased, to find that acceptance in my email. I shall be eternally grateful that I will have the chance again to vend at such a lovely show (for the little time I spent there the last time I vended, I really liked the crowd!). I'm working on getting my payment sent in, but I'll keep y'all posted! A couple weeks late is better than never, eh? I wanted to do a short recap of the last show I went to (in keeping with my convention recap tradition), for both outsider and insider information! Namely, I had seen some grousing here and there about the show, so I wanted to give y'all the view of an Artist Alley table. 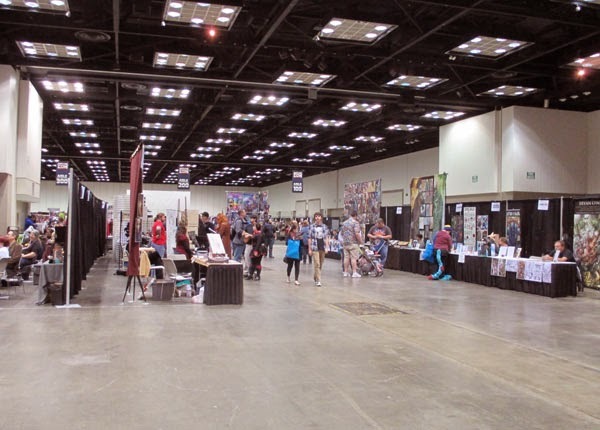 Awesome Con was a sort-of-but-not-really "First" year convention in Indianapolis. 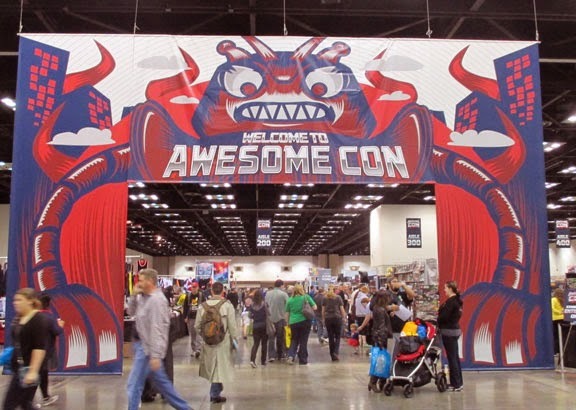 Awesome Con is a set of at least 2 other conventions at other locations in the US. (If I recall correctly it's one on each coast? But don't quote me on that). Since I had friends in the area who were interested in the show, I figured, WHY NOT and tossed my hat in with em! My partner handled the communication through the staff, and according to her, they were nothing but very accomodating. 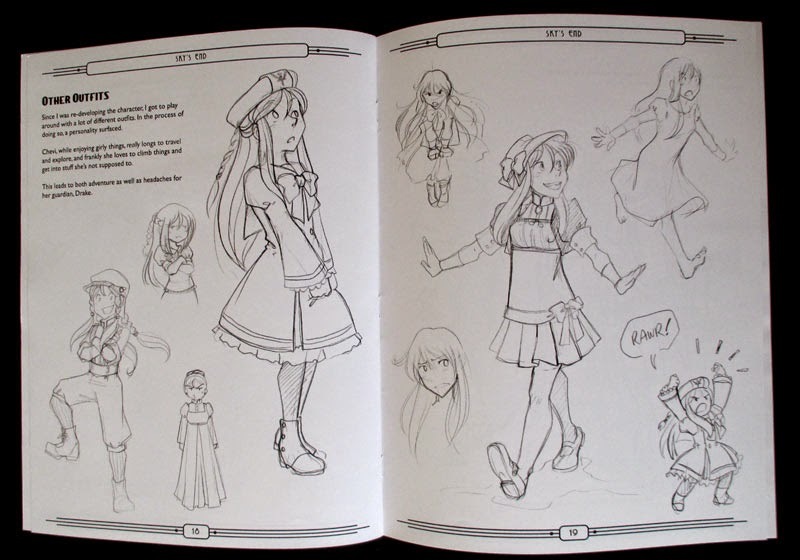 They even let us do a little interview (that all the artists could fill out at their choice), and posted it on the site. 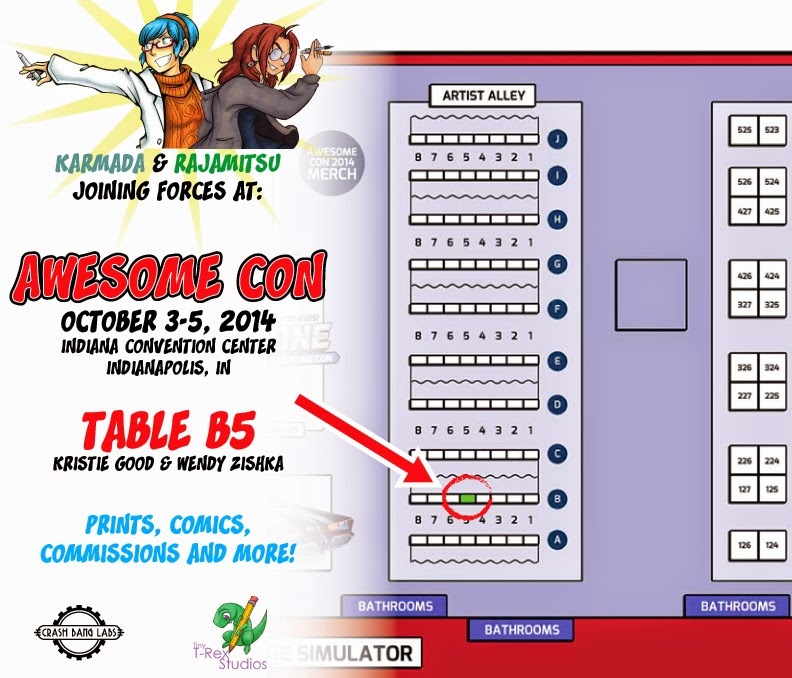 We also got table locations pretty timely, I just happened to be dealing with all the American Sewing Expo stuff so I forgot to advertise more (SHAME ON ME). This is where we were at in the Artist's Alley! The booths were a little on the "expensive" side for a first year show with no guaranteed attendance, so I split a table with my friend Tiny T-Rex (if you haven't gone and liked her page, you should cause her art's really cute!). 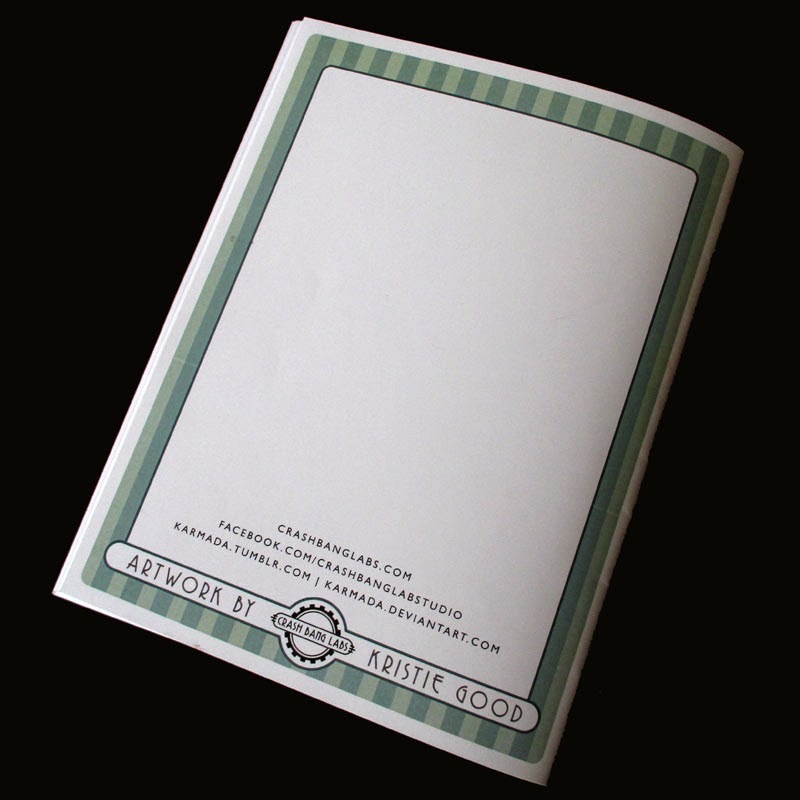 We had also formulated a plan to set up our booths differently, as we discovered at Pop Con that sometimes the big wall-o-prints you see at Anime Cons just aren't as well received at Comic Cons. It was mostly an experiment with somewhat low overhead for us, and we got to support the local shows! We arrived on Thursday afternoon to set up, and it was …well, AWESOME because they let us use the loading docks, where we could park the car (free), and keep it there until we were done setting up. One thing I always forget about this Indianapolis Convention Center is on set up day they do NOT have air conditioning going. At any show that's NOT in Winter, and even those who are… BRING WATER. OMG. I was dying of thirst. Again. You'd think I'd remember this from Pop Con but NOOOOOOOO. So new update on things to bring to shows during set up: bottle of water. Set up went fine, and we were given all the times of the show (they were listed on the badges), and, I KID YOU NOT: each booth had its own little cardboard trashcan. I was enamored with this all weekend. It's the little things, you guys. Just remember this. Also neat things we had: drapes and pipes! It's happened at a few shows, and honestly, I'm kinda getting partial to it. I like not having to compete for visual space with the people behind me, regardless of what they're selling. It also keeps us from interfering with each other's space behind us. And Rows. I love rows. I don't care what anybody else says, please, use rows at your shows as best as possible. ANYWAY, they had a pretty neat set up. There was this really cool entryway thing, and all the rooms had specific "Awesome Con" backdrops. This company has clearly done a lot of cons and had a lot of experience to back themselves up. The convention itself, however, was… well… how do I put it… sparse? There was a ton of space they were utilizing for the event, expecting a good amount of people. Here's a shot from Saturday, midday in the artist's area. who is sometimes claustrophobic in tiny Alleys. As you can see, a very professional set up – we're just missing some important things, like attendees. But I'm not going to say that there wasn't a market for attendees at this particular con. It unfortunately suffered from "bad timing". During that same weekend we had something called Circle City Classic- which the only way I can describe it is a homecoming-like festival for a football match between two widely known local colleges. They had tents, and musicians, and more. There was also a Colts game downtown on Sunday, as well as a local Film Festival (with at least one prestigious guest), a single-weekend renfaire that's popular and something called Feast of the Hunter's moon. All on the same weekend as Awesome Con. So it's not that people didn't want to go, but some may have planned otherwise. The $20 parking fees didn't help either. Thanks to the big events happening downtown, we had event rates. Which, if you're just going to visit the con for a few hours, that's a real painful tax, and I'll admit probably kept some people away. But I'm not going to (entirely) fault that on Awesome Con. Should they have researched the weekend before hand? Probably. Would that stop me from trying to vend in future years? Probably not. Overall, on the business side, I know the artists were having a rough time, and I'm not sure how the main vendors fared. I did okay enough, but I consider my [relative] success a lucky fluke. It wasn't that sales were "terrible" it was mostly there wasn't a large enough pool of customers for the size of the con. Another problem I noticed was that there was an extreme lack of paneling at this particular show. I feel it's probably because their other (much larger shows) garner attendees based on guest signings, memorabilia and the collectors, so other outside events were on the down low for them. But for a show so sparse, with not much to do, I fear a lot of the attendees got restless and probably left earlier than planned as there were maybe 4 panel rooms, with very few panels going on over the weekend. The show made the best of it they could, and we had some pretty fabulous announcers overhead. Basically they let the voice actors get a hold of the mic and we had things announced by Hermes from Futurama, Invader Zim, Gir, and OMGGGG DARKWING DUCK. MULTIPLE TIMES. I may have made fangirl squeals when it happened. MY CHILDHOOD. So while we didn't have as heavy a traffic, at least the announcers kept us awake and updated! + HUGE SPACE, Big Table! + They let the voice actors use the overhead microphones and it was AMAZING. = Research the other shows, cons, and events happening in the area. If they're planning on returning (unknown at this time of posting), it might be wise to coordinate with other shows. = Advertise a little more? Apparently advertising was an almost too-little-too-late sort of thing? = Adjust table prices at the smaller shows to ensure filled tables (apparently the table price was lowered after a period of time, which was most sad as we had paid the higher price). Most likely! As long as I'm able to stay nearby with people I know and don't have to buy a hotel, I'd definitely give the show another try. It had a good atmosphere, and I really liked the set up and staff. Had a pretty good time, but now it's time to focus on my next two shows: YOUMACON and NEKOCON! As mentioned earlier, I ended up being a judge for their very first Costume Contest, and I must say, I loved ALL my contestants. You guys were great and made our jobs really difficult! (that's a good thing, for those new to costume contests). I hope you all had a great time and return to the show next year! I wanna see what ELSE you guys come up with! On a side note, they let me be the Emcee. :P and if you all know me, you know I love being the emcee for these kinds of things. I just hope I remembered all the details correctly as I spoke about your outfits as you walked down the runway. It was a lot of stories to remember! I wanted to make a separate post about this show, as there seemed to be mixed feelings from multiple accounts. It wasn't bad, but it wasn't great, and I see a lot of promise. Just a few things out of our hands kind of went wrong and it was nothing we could have accounted for at the time. BUT I'LL TALK ABOUT THAT LATER. Hey! Did you know I'm participating in Inktober? It's this drawing thing I learned of on tumblr where for each day in October, you draw an inked image. I'm doing a bit better this year, as I'm up to 10 images scanned in, and I'm playing catch up a little bit today! I CAN DO THIS. Soooooooo since timings were unfortunate, I wasn't able to get my new comic chapters to the printer yet (but they're in queue and are being written/drawn at this time). But I wanted something new for people with my artwork! And that's when I discovered SKETCHBOOKS. I had picked one or two up at cons in years past, and I picked up a couple of them at Awesome Con, and I must say I really like them! So I am making one myself, and I'll have some pictures in a bit after I finish editing the text (thank you PHD COSPLAY). I think that's about it! I'll be back soon this week with recaps and updates!